Mike Hookem MEP, UKIP defence spokesman, will be fighting the seat of Wentworth and Dearne at the general election. Mike, along with fellow UKIP MEP Jane Collins, will be giving the voters of Rotherham a real choice on May 7th. The news follows a string of impressive election results for UKIP in South Yorkshire including winning many local council seats last May. However, Mike acknowledged that winning the parliamentary seat would require some serious work as the sitting Labour MP, John Healey, won the seat in 2010 with a 13,000 margin. 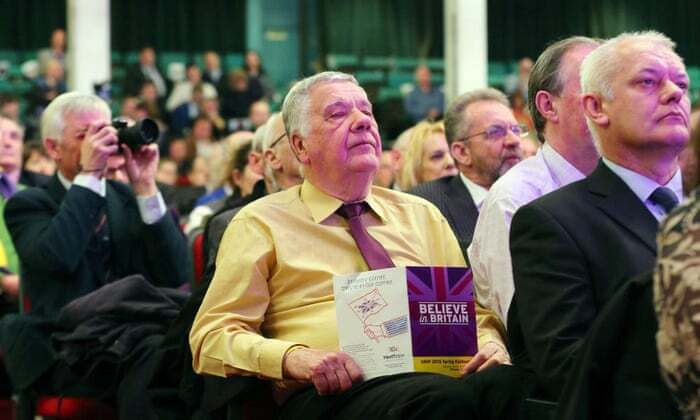 Mike urged all UKIP members to join the campaign to topple the Labour MP. ….seems they totally forgotten about Allen Cowles UKIP PPC Rother Valley ! This entry was posted in Nigel Farage, UKIP and tagged Mike Hookem, Nigel Farage, UKIP by Rik. Bookmark the permalink. When are you going to upload it ? When it arrives, I will publish it, Rik. UKIP most trusted on Immigration – Comres poll for ITV today. 36%	Trust Ukip most to control immigration. 37%	Associate the word nasty with Ukip. 44%	Agree Ukip are a racist party. It is little surprise the word Nasty is associated with UKIP, it’s a phrase that’s often used to describe them in the media and in parliament by their opponents. The public pick up on catchwords like this, so when asked the question it’s obvious what the answer is even if you don’t actually think they are nasty at all, you associate the word nasty with them. If I asked you which party do you most associate the words “Loony Left” with, what would your answer be? And I like how they say “Britons are also mostly likely to say immigration has no impact on their ability to find their job” and then put the figure of 44% next to it. Simple maths tells you that if 44% think it has no impact, the remaining 56% think it does. Last time I checked 56% was higher than 44%, so in fact Britons are most likely to say immigration DOES have an impact. I’m not a UKIP supporter, I’m not likely to vote for them in May, but even so I think this is a piss poor effort designed to weaken UKIP in the build up to the election. The people who covered up the grooming gangs don’t want to face what they did so they’re projecting their guilty conscience onto UKIP. Got room for a stowaway RR? If need be, yes. Just make sure you have an uptodate passport! All these questions would be fine, provided they asked the same about the other political parties. They didn’t do this. It might have been within the rules, but when weighted questions such as these are asked you have to question the validity of the whole piece. Do you see what I’m saying? I can understand the point you are making about table 24 , but it is IMHO quite acceptable for ITN to commission a poll that looks only at people’s perception of UKIP. Both of us know what tory and labour votes look and sound like and their national distribution, but then along came UKIP. Quite recently it was the party of the golf club bar bores of the South East of England and people without any science background who rejected climate change; now it claims to be the party of the disenfranchised northern working class, whilst appearing to be the party of the people of the decayed coastal towns of the east coast. I have never been involved in this field, but I’ve spend a lot of time working hard at getting even proxies for the data that I needed to have, and it was always selective data. Bias only comes in how the data is spun after the survey. Like when they said “Britons are also mostly likely to say immigration has no impact on their ability to find their job”, then quote a figure which shows less than half of us actually think that? If it had said “almost half of Britons”, or “44% of Britons” then fine, but they tried to make it sound like the majority of Britons think that. Hence it shows bias. If the entire poll was intended to look specifically at peoples perceptions of UKIP then I’d be inclined to agree, but it starts by asking about all the parties and then singles UKIP out for special treatment. IMHO that isn’t how it should be done at all. We now know how many people think UKIP are a racist party, for example, but know nothing about how many think the same of the Tories, or if they think Labour has any credible policies. There are plenty of things you and I agree on Reg, so I’m happy to agree to disagree on this one if you are? We could go on for days getting nowhere otherwise, lol. Very interesting, but my own local opinion poll shows 100% trust in Ukip on immigration and 100% trust in Ukip on running RMBC. Doubtless the outcome in May will show slightly less support for Ukip, since the Donkey Red Rosette brigade are incapable of changing their colour. Three cheers for the Commissioners! what was your sample size? If the people of Rotherham vote Labour in May then the people will have got what they deserve. We can not let apathy stop this corrupt Labour council from being booted into the past. Let’s hope the good folks of Rotherham have the cojones when May comes around. Dave, re Balls (the UKIP, not the Ed variety). 1. If what appeared today in the Tizer was accurate, then Martin Parker’s pair must be still feel very painful. 2. I’d not come across the Conservative Woman site before, so thanks. It has an interesting array of Editors: http://conservativewoman.co.uk/about-conservative-woman/ , none of whom have balls – certainly not in the literal sense. But then I find that the piece you linked to was written by a male person, named Andrew Tekle-Cadman, who just happens to be this guy: http://ukipdaily.com/author/andrew-tekle-cadman/ , and it gave me one of those Mandy Rice-Davies (RIP) “Well, he would say that” moments. Labour nationally have shown they are prepared to bury this and they’ll only change if they start losing seats over it so if people want this issue dealt with then it has to be anyone but Labour in the seats where it’s been happening.